Customer orders can be entered and maintained and referenced back to the customer's order number. The cumulative quantity on order for a stock item shows as a demand in stock status inquiries. The cumulative quantity on order for assembly items shows the demand against its components in the stock status inquiries. The quantity of the order left to invoice is maintained and updated for invoices and credit notes raised against the order. The orders entered can be invoiced directly with little or no additional input. Multiple dispatches are possible from a single order. Order retains references to each dispatch. Differences from the order are logged when dispatches are not the same as the ordered quantities for reporting delivery in full on time. Pricing automatically returned based on the customer sales type, branch and currency. Quantity break discounts across a range of products are automatically calculated based on the discount matrix. Packing slips printable on laser or pre-printed stationery. User selectable inventory location to pick from. Free form entry of delivery addresses - defaulting to the customer branch physical address. From the main menu, Orders tab, click the Order Entry link. Initially, the order entry page shows the options to allow selection of a customer and branch. 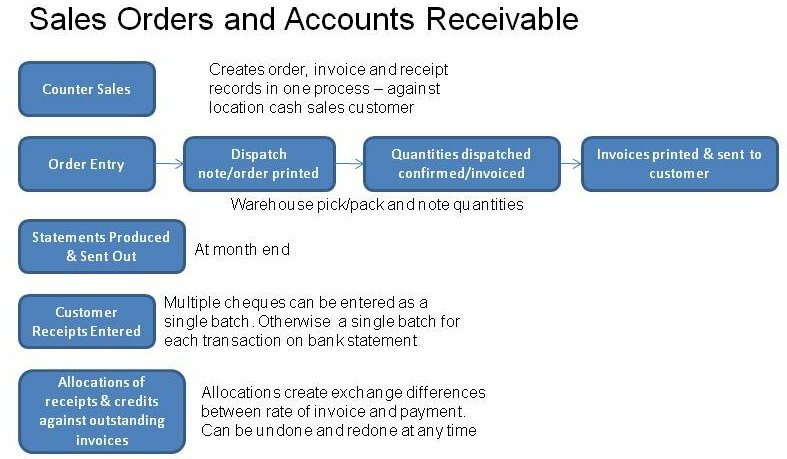 The customer is the actual charge account to where the order should be billed and the branch contains all the information about delivery. The customer search facilities are similar to the select customer script, but the code actually looks up on the branch code of the customer, only branches are displayed with accompanying customer charge to information. Searching for a customer can be either by entering a letter or letters in the branch code or by entering some keywords (or section of) in the customer name. Searching in this way minimises the result set returned (possibly over a dial up connection) to ensure the response is as speedy as possible to the users browser. All branches matching the criteria entered and not flagged as disabled for transactions, are returned each one with a button on the customer code. Hitting the button for the desired customer/branch selects it as the customer and branch to deliver the order to. There is opportunity later to modify the delivery details if need be. The order now shows the quick entry screen headed up with the name of the customer and branch, together with the sales type of the customer. There are two ways to select the line items for the order. By default a "quick entry" screen shows allowing the direct entry of the inventory code and the quantity required for the order. The number of lines shown on this quick entry table is defined by a variable in config.php - $QuickEntryLines which is user modifiable. After the user has entered any number of lines into this table, hitting the Quick Entry button processes the items entered into the order. The prices are retrieved based on the sales type, the currency, customer branch and the charge to customer of the order. If there were insufficient lines to enter all part codes for the order, the same process can be repeated with the quick entry table shown below the order summary after the first quick entry has been processed. On the quick entry screen there is a button to search parts. This button enables the user to search for a part based on the stock category and/or any part of the item's description and/or any element of the item's code. Hitting the search button after making appropriate entries in the code or description fields shows the part codes and descriptions together with picture of the item - if one has been uploaded to the server for all parts. Part pictures must be in .jpg format with a file name identical to the part code but with the extension .jpg, and it must reside in the directory specified in config.php for part_pics. The item code is displayed as a button and the system automatically puts one of the item selected onto the order. Additional parts can be selected in the same way. Having selected the parts for the order, it is possible to edit the quantities, price and discount applicable to each line of the order. To get the order values to re-calculate the "Recalulate" button must be clicked (this is the compromise of using server side scripting - PHP - to the exclusion of any client side - java - processing). Discounts will be calculated using the Discount Matrix functionality described under that section within the order based on the quantities that are entered. If a line entered, displays against a red background this means that the system inventory is showing insufficient stock to cover the order line, from the inventory location as defaulted from the customer branch record - as the most appropriate inventory location to draw the stock for this branch's orders. The item code displayed is also a link to a new browser window showing the stock status inquiry for the item, this shows the stock available at all locations. A line can be deleted at any time by clicking on the link at the end of the line to delete it. The whole order can be cancelled at any time by clicking on the "Cancel Whole Order" button. The customer can also be changed at any time. Once all the line items have been selected the Delivery Details button must be clicked. Note that there have been no changes to the database at all. The data entered exists only as a server side cookie - a file on the web-server. Delivery details must be confirmed before the order can be placed. By default the delivery details are obtained from the physical address of the branch. However, any of the information in this screen can be over-ridden. This information prints on the dispatch/packing slip and on the invoice. The inventory location where the stock for the order is to be drawn from is defaulted from the customer branch record. However, it is possible to select an alternative inventory location if the order is to be picked from elsewhere. The customer's order reference should be entered here and the most appropriate freight company should be selected. The system keeps track of the last freight company used to deliver to the branch and uses this as the default, if it is over-ridden then this new value is stored against the branch. It is possible to go back to the line item entry screen retaining all the data entered on the delivery details screen by clicking on the modify line items button. If the inventory location to draw from has been changed the colouring of the background of the line items will be updated to reflect the stock available at the new location to pick from. If the automatic freight calculations are being used - see the parameters in config.php, the freight cost will be calculated based on the sum of the whole order cubic metres and weight. The best shipping company will also be returned. The user can choose to charge the freight calculated or just use the cheapest freight company. The freight charge calculated can be over-ridden if required. Once all details are entered correctly the Place Order button should be clicked. It is important to note that abandoning the order before this button is clicked there have been no updates to the database and nothing is saved. Clicking into some other screen loses the order as entered. Whilst it is perfectly acceptable to have several browser screens open looking at different inquiries at the same time. It is not possible to have two windows entering two separate sales orders at the same time, entries in the one window will over-write the other. In version 3.12 of webERP a new feature was introduced which allowed for cash sales to be entered directly without first entering an order and then confirming a dispatch to invoice. This feature is known as "counter sales". From the main menu->Sales tab select Enter Counter Sales. Entry is similar to entering an order, by default the quick entry screen allows entry of item codes and quantities but it is also possible to select items by the search functions in much the same way as an order. The tax is calculated and the total amount to pay is shown. This page also expects the payment to be made and entered. The payment entered is automatically allocated to the sale. Behind the scenes this script produces all the database entries for an order and an invoice with sales analysis, stock movements etc etc all correctly created. The customer (and customer branch) used for the entries is derived from the user's default inventory location. webERP looks at the user's default location and then looks up against the location record to find the cash sales debtor account (and branch) to use for counter sales entered. Each location for which counter sales are required must first be set up with the cash sales customer and branch which is to be used for counter sales entered. Note that the default location of the customer branch is ignored - the user's default location (see Setup->General->User Maintenance - the script webERP/WWW_Users.php) is used as the location and stock movements are all created from this location against the customer specified in the location record (Setup - > Inventory Setup -> Location Maintenance - the script webERP/Locations.php). To specify the customer and branch to use for counter sales for an inventory location (or warehouse), the customer code and branch code must be entered in the format customercode-branchcode in the field provided for this purpose. i.e. the customer code then a hyphen then the branch code. Only Outstanding sales orders can be modified. Only these orders have any balance of a quantity remaining to be delivered and/or invoiced. Order lines that have been invoiced completely will not be available for modification. New items cannot be added to the order. Pricing cannot be altered if any amount of the line has already been delivered/invoiced. Quantities of an order line cannot be reduced below the quantity of the line already invoiced. Note that changing the delivery address of an outstanding order that has already had some of the order delivered and invoiced will affect re-prints of the initial invoice - it will show as being delivered to the order delivery address that has been modified. Hard copy of original invoices are required. If the item ordered is known, sales orders can be selected that have the item on by first selecting the item in the Select Item page, once the item is selected a link to show outstanding sales orders is displayed. If the customer is known, then first select this customer then use the link on the customer selection menu to show only the outstanding orders for the customer selected. All outstanding orders can be displayed by entering the Outstanding Sales Orders screen without a customer or item directly from the main menu under the orders tab. The outstanding Sales Orders screen also has facilities for looking up a part directly as well. The Outstanding sales orders are shown by inventory location, the inventory location desired can be selected on this screen, by default the location defined as the default for the user is shown. The orders matching the criteria are only shown when the user clicks on the search orders button. The orders displayed each show links to modify the line items, invoice the order or print the dispatch note. If the order has already been printed this link will show that it has already been printed to avoid printing several dispatch notes and risk doubling up deliveries. A quotation can be entered for any customer/branch in much the same way as entry of an order. The pricing can be changed and discounts entered for the quotation in the same way as an order. An order is flagged as a quotation from the Delivery Details screen. On entry of a quotation a link to produce a pdf quotation for sending to the customer is available. If the quotation option is selected then the stock is not reserved in the stock status inquiries. Quotations can shown on the outstanding sales orders screen by selecting the option to show quotations. When this option is set only quotations show, there is a link so that they can be modified and if necessary changed to a sales order, there is also a link to re-print the pdf quotation. Having changed a quotation to a sales order, from then on the process is the same as for any other sales order, a packing slip can be printed and the order confirmed for invoicing. If the order entered contains only 'dummy' service items - ie those items that do not refer to physical stock that requires advice to warehouse people to effect the delivery - then the order can be flagged to invoice automatically. It is possible to review the recurring order templates currently defined from the SelectRecurringSalesOrder.php script which allows the entry of the dispatch location and then lists all those recurring order templates that are defined to be dispatched from this location. From this selection screen it is also possible to select the template for modification. Line items on the order cannot be modified here, only the frequency, start and stop dates. If line items need to be modified then the template can be deleted and a new template created. The sales orders are created from the recurring sales order templates by the script RecurringSalesOrderProcess.php. This script loops through all the recurring order templates and creates the orders as necessary based on the current date and the last time an order was created for the template and the frequency it is to recurr. The date of the last recurrence is updated in the template as the date of the last recurrence + the number of days between recurrences. An email is also produced for the email contact stored in the location record from where the delivery is to be effected from. The email advises that an order was created, the order number and if it was auto-invoiced. Ideally this script should be run from a scheduler/cron daily. It can be run as many times as you like and only create the orders required - without duplicating incorrectly. webERP has a system called a discount matrix which allows any group of products to be defined and discounts applicable to all items of the group to be set up just once for the whole group of items. Different discounts can be applied to the "discount group" for each sales type (price list). When an item is entered into a sales order the system retrieves the correct price based on the customer's sales type (price list) and then retrieves the appropriate discount based on the quantity of the item and the other items already entered on the order. The discounts retrieved can be over-ridden. Select an item that you wish to have a discount structure applied to it - using the "Select Item" link. Under the "Item Maintenance" section click on "Maintain Discount Category". If there are no currently available discount categories then enter a discount category code - otherwise select the discount category that you wish to allocate the item to. You can now search for additional items and add as many items to the discount group as you wish from this screen. Having created the discount group you can now administer the discount rates applicable to this group of items.